PORTLAND -- More often than not, the NBA Playoffs are defined by star players. Tuesday night, Portland’s stars came out. Portland’s starting backcourt of Damian Lillard and CJ McCollum combined for 62 points to lead the Trail Blazer to a 114-94 victory versus the Oklahoma City Thunder in Game Two of their first-round playoff series. The Trail Blazers now lead the series 2-0 with the next two games to be played in Oklahoma City. Portland has not led a playoff series 2-0 since the first round of the 2014 NBA Playoffs. After the Trail Blazers jumped out to an early lead in Game One, Oklahoma City dictated the action early on in Game Two. The Thunder continued to struggle shooting from three, but unlike in Game One, so too did the Trail Blazers. So shooting 56 percent from the field despite going just 2-of-7 from three, the Thunder took a 31-26 advantage into the second quarter. Oklahoma City would take their largest lead of the game with just five minutes to play in the second quarter after a Russell Westbrook layup give the Thunder a 46-36 advantage. But Portland doubled up Oklahoma City in scoring over the next five minutes to get back into the game before the intermission. And by time McCollum hit a three at the halftime buzzer to knot the score at 54-54, the momentum, not to mention the a rowdy home crowd, was squarely in Portland's corner. "I felt like I had a good workout, my diet has been pretty good these past couple of weeks, my body just feels good," said McCollum. "It’s been overcoming an injury; this is probably my fourth game since coming back from the injury, so I just needed to find that rhythm, which is very important for me." The momentum from a late-quarter rally and a buzzer-beater carried over into the third quarter. 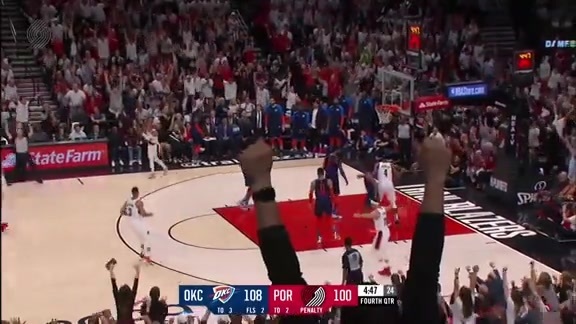 Though the Thunder shot 50 percent from the field, Portland turned eight turnovers into 16 points, went 6-of-11 from three and shot 61 percent from the field to outscore the visitors by 13 in the third to take a commanding 91-75 lead into the fourth. Oklahoma City never really threatened thereafter, getting no closer than within 14. 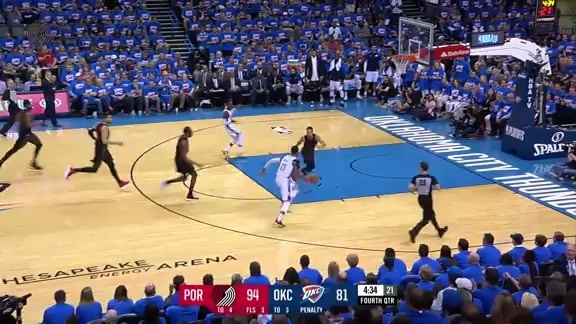 Portland would push the lead up to 21 after two McCollum free throws, prompting Thunder coach Billy Donovan to wave the white flag with 3:31 to play. A minute later and with the game all but decided, Terry Stotts would do the same. McCollum led all scorers with 33 points on 12-of-22 shooting from the field, eight rebounds, five assists and a steal in 36 minutes. It is the fifth time in McCollum’s career that he’s scored at least 30 points in a playoff game. 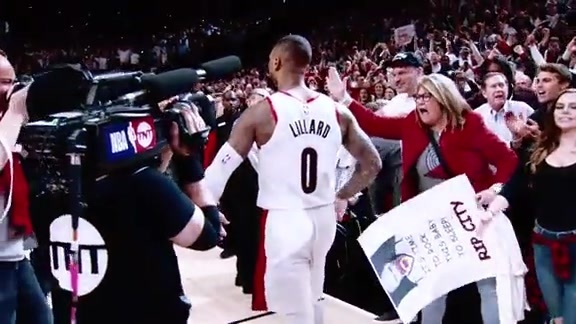 Lillard went 10-of-21 from the field and 4-of-8 from three to finish with 29 points to go with six assists, four rebounds, three steals and two blocks in just under 27 minutes. He also was primarily responsible for holding Russell Westbrook to just 14 points on 5-of-20 shooting. After a superb defensive effort in Game One, Moe Harkless outdid himself on both ends in Game Two, going 6-of-9 from the field for 14 points while also tallying nine rebounds, a steal and a block in 28 minutes. Seth Curry came off the bench to hit three three-pointers in the second half to finish with nine points in 18 minutes. Paul George led the Thunder with 27 points to go with eight rebounds, three assists and a steal. Steven Adam finished a rebound short of a double-double with 16 points and nine rebounds in 30 minutes. the series moves to Oklahoma City for Game Three, scheduled for Friday at 6:30 p.m. on NBC Sports Northwest, Rip City Radio 620 AM and ESPN. • The Trail Blazers lead the Thunder, 2-0, in their best-of-seven First Round series. It is Portland’s first 2-0 series lead since the First Round of the 2014 NBA Playoffs. The Trail Blazers won that series, 4-2. • Portland shot 13-of-32 from the three-point line (40.6%) while the Thunder shot 5-of-28 from deep (17.9% 3-PT). • The Trail Blazers outscored Oklahoma City on the fast break, 19-11. • The Portland bench outscored the Thunder reserves, 26-25. • With a 20-point victory, the Trail Blazers recorded their largest margin of victory in the playoffs since beating Dallas, 125-103, on May 2, 2003. • The Trail Blazers made 18 of their 21 free throw attempts (81.0%) while Oklahoma City connected on 18 of their 28 attempts (67.9%). With Portland's home-court advantage protected, the series moves to Oklahoma City for the next two games. Game Three is scheduled for Friday at 6:30 p.m. on NBC Sports Northwest, Rip City Radio 620 AM and ESPN.